Hello! Thank you so much for your interest in reading the 12 Things to pray for the spouse of someone with a Chronic Health Condition! The 12 Things to Pray EBook is now available on Amazon! You can find it HERE! Such sweet prayers--Thanks for sharing this! Thank you so much for stopping by and your sweet comment Chelsea!! Thank you so much for stopping by and taking the time to comment Ladonna. I appreciate your kind words! p.s.- I wish that I could have replied directly to you but unfortunately you are a "no reply blogger" so I was unable to send you and email I look forward to hopefully connecting with you more in the future! I know a parent with a very ill child. It is incredibly hard and she always asks that I pray for her child and her family. Thank you for the great prayer ideas. So many things that would have never crossed my mind. As we all do, I hope to not be in this position anytime soon but it would be reassuring to know others were praying for us! Jennifer, Thank you so much for your heartfelt comment. I know what you mean about not having many of these things cross my mind. So many times I have never considered the heartache and the difficulty of those who are suffering in so many different ways. I pray that that these suggestions of items to pray would be an encouragement for those who are in this situation. Thank you again for such a lovely heartfelt comment!! I have enjoyed your writing. I personally have been dealing with chronic migraines and rebound head aches for 10 years. My kids are 22, 21 and 16. I worked all the time before I became ill. I didn't deal with it well in my opinion because I tried to pretend I was ok and hide all the pain I was in. I had my kids do "chores" to give myself some help without having to ask for it and appear weak or a failure. I have resently given my life back to God and have a new outlook and am researching how to live with chronic pain. I feel i am doing better with my teen son than I did with my girls and that can be credited to God. Anyway... To my complete suprise my daughter are expressing built up resentment, frustration, anger, feelings of neglect and so on. I never knew how I was dealing with my chronic pain was affecting my kids. This is all really new revelations here. 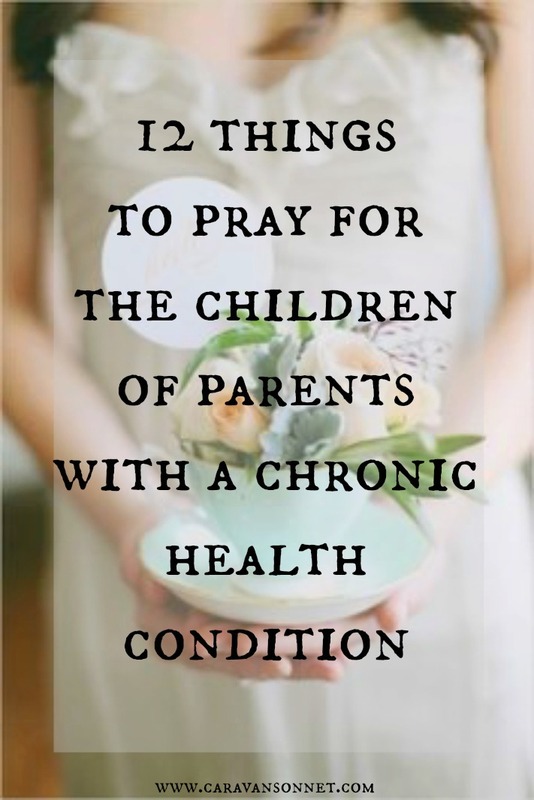 So, could you share prayers for kids living with a parent of chronic pain. One they can pray for themselves or one I can pray for them. They are hurting and that breaks my heart. Guilt is another thing to pray for. I have so mich guilt over how my kids suffered. I don't feel I am asking for the correct prayers but I have explained in a nut shell and I have faith God will lead you to a good reply for this. Young adults who resent their parent for chronic pain maybe. My kids took on my mom rolls as chores. If they had known it was because i was in pain i think maybe we would not be in the pickle we are in today. Pray for healing of my girls heart and that they can forgive and let go of the past. Thank you for writing these. They are a blessing. God Bless.